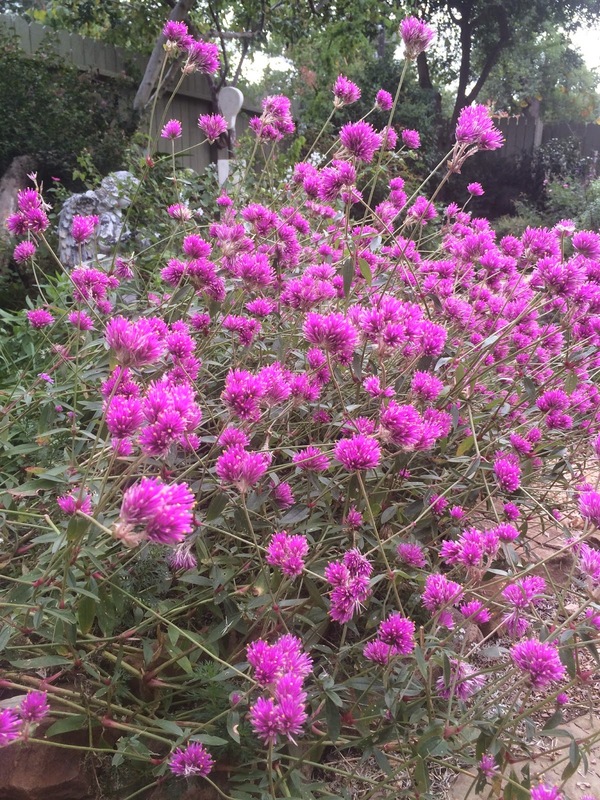 When the reports first began to appear of a polar vortex swooping down upon south central Texas to wreak havoc and destruction in the form of a historically early freeze, the Head Gardener and I scoffed. In 17 years on my corner of Katy, neither of us can remember the mercury dipping below freezing before December ... and we were unanimous in that. That in itself is as rare as a freeze in November! But as the forecast dipped lower and then lower again over the course of the week, I confess that we both began to wonder if perhaps we'd been too hasty in our judgment. By mid-day yesterday, models were showing a sustained period - 3 to 6 hours - of temperatures in the 28 to 30 degree range. The HG and I had to make a decision: did we unearth the frost cloth and old sheets from the depths of closets and the garage, then venture forth into the chilly and breezy afternoon to cover those plants which were not only tender, but valued? Readers, we did not. 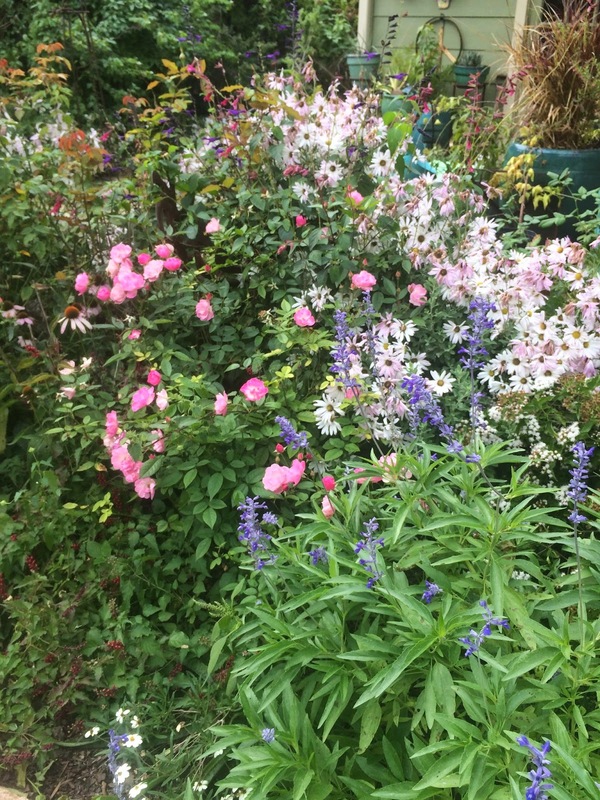 We sat in our warm and comfy living room, read the latest Darling Dahlias cozy mystery from Susan Wittig Albert and told ourselves that we'd leave the fate of the garden up to Mother Nature. The frost cloth and sheets remained in the closet and garage, and we remained warm and comfy. And we chose well ... The HG's first thought upon waking was to check the temperature. 37 degrees is unseasonably cold but not cold enough to damage most of the plants on my corner of Katy. We haven't gone walkabout yet to survey the garden but when we do, we don't expect to find anything of real concern. We were ready to say goodbye to the coleus, anyway! I think you made the right choice. Mother Nature is hard to deny. I always cover for the first several freeze warnings then finally accept what Layanee said! Glad your beauties were spared! I'm glad to hear there was something you and the HG could agree about. No frost until December would be a miracle here. 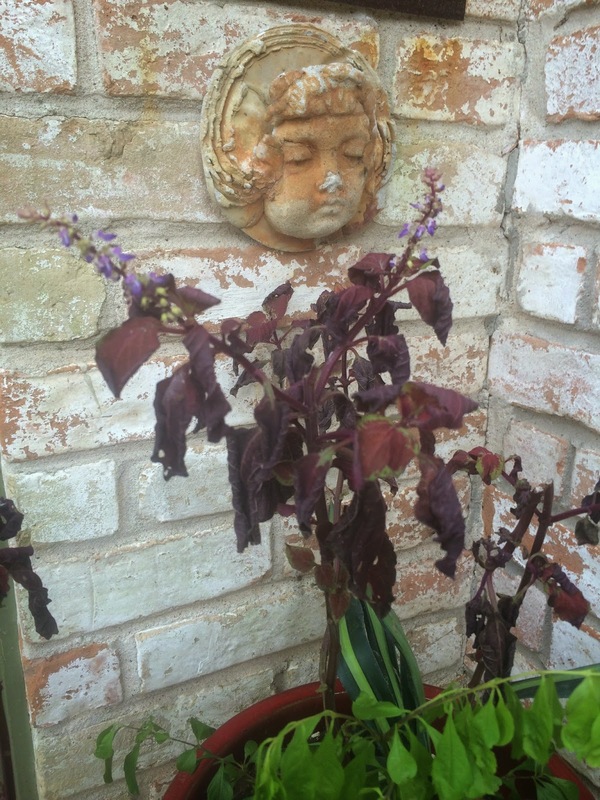 Fortunately, it's only the Coleus that Mother Nature slapped around, and not you and the HG. We did not cover either just brought tropicals off the porch. Wondering what the rest of winter will bring? Yes, that was my attitude, too! And super thanks about the last Darling Dahlias. Somehow I missed that. Ya'll stay warm, you hear? I'm looking out my window at our first white covering up here in Vermont. We had an unusually late killing frost...I think it was late October! Love your garden. I love nothing more than getting my hands dirty in the garden. However, I have a much shorter season to play in the dirt. Definitely a close call! I was surprised that we narrowly missed any damage. You can only dodge a bullet so long; when the first killing frost hit us, I was ready for a gardening break anyway. 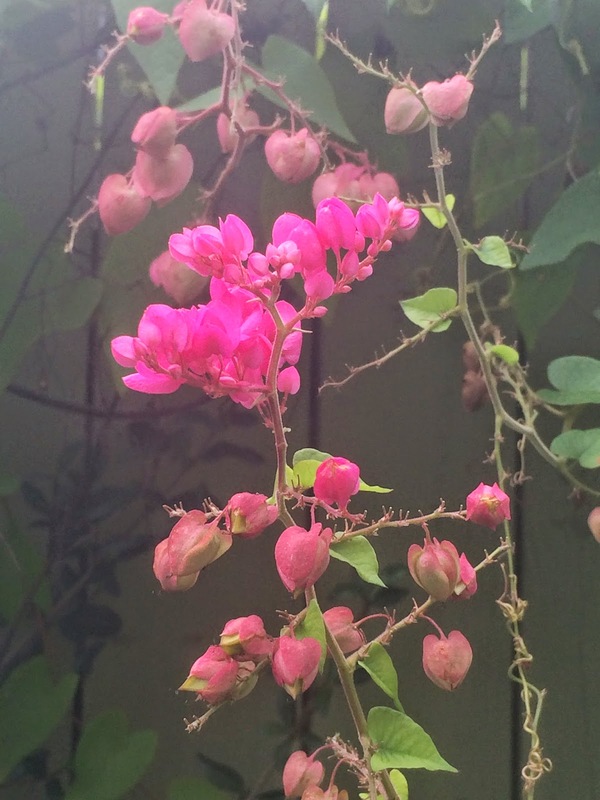 I have a question for you, Cindy--the coral vine pictured here is not the same as Carolina coralvine, is it? That is what was growing at my daughter's when we visited her in Dallas this past week. It took me awhile to get an i.d. 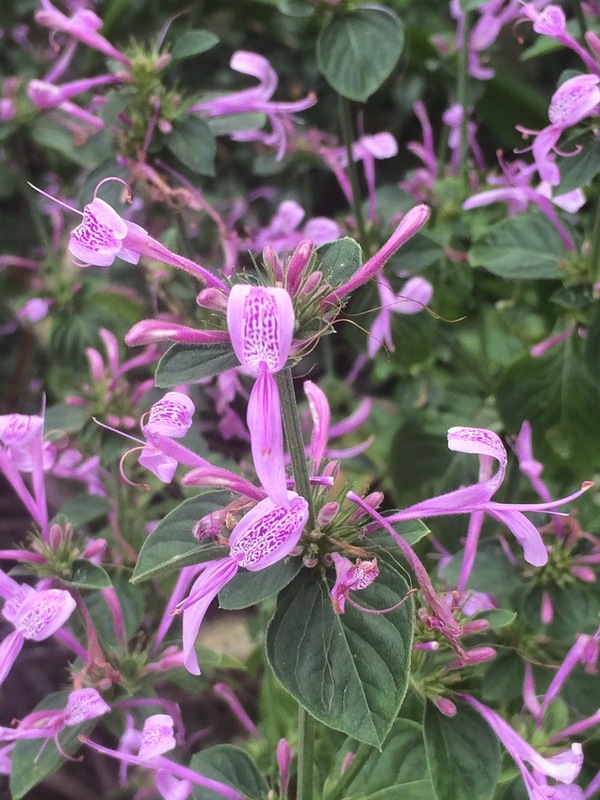 on it, but it was growing rampant everywhere and encircling some of her shrubs, so I thought it was a type of invasive plant and pulled most of it. I hope I didn't make a mistake! Rose, I've not heard of Carolina coral vine. This is the only coral vine I know. It's an aggressive vine but I've kept it under control by whacking it back a few times before I let it bloom. No worries if it's the same vine your daughter has. Chances are good it will return from seed, if not from roots. I'm glad you dodged a bullet -- your flowers are beautiful! I love stories where inertia is the right decision.